Samsung Easy Document Creator allows users to easily scan documents (JPG, PDF, eBook and other formats), then upload them to an SNS. currently includes direct faxing, mobile conversion support, and built-in sharing for social media. 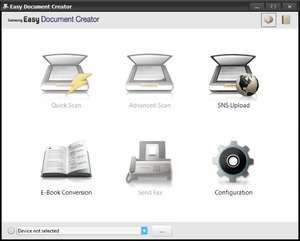 Easy Document Creator is designed to easily scan JPG, PDF, eBook, and other formats to save or upload to an SNS. It has a range of easy-to-use features that enhance a business's productivity and creativity. Version 1.05.87 is a freeware program which does not have restrictions and it's free so it doesn't cost anything. For security reasons, you should also check out the Samsung Easy Document Creator download at LO4D.com which includes virus and malware tests. Additional screenshots of this application download may be available, too.